It’s extremely important to work on selective coordination of circuit breakers in the design phase of a system. After switchboards, distribution panels, MCCs, lighting switchboards, etc. are installed, there typically is little that can be done to retroactively “fix” a system that is not selectively coordinated. While it’s very important, it is not enough to select circuit breakers based solely on their ability to carry the system load current and interrupt the maximum fault current at their respective points of application. It is important to note that the type of overcurrent protective devices and ratings (or settings) selected determine if a system is selectively coordinated. A properly engineered and installed system will allow only the nearest upstream overcurrent protective device to open for both overloads and all types of short-circuits, leaving the remainder of the system undisturbed and preserving continuity of service. Isolation of a faulted circuit from the remainder of the installation is critical in today’s modern electrical systems. Power blackouts cannot be tolerated. When using molded case circuit breakers of this type, there are three basic curve considerations that must be understood (see Figure 1). These are overload region, instantaneous region with unlatching and interrupting rating. Overloads typically can be tolerated by the circuit components for relatively longer times than faults and therefore, the opening times are in the range of seconds and minutes. As can be seen, the overload region has a tolerance band, which means the breaker should open within that area for a particular overload current. A circuit breaker will open as quickly as possible. The instantaneous trip (IT) setting indicates the multiple of the full load rating at which the circuit breaker starts to operate in its instantaneous region. Circuit breakers with instantaneous trips either have (1) fixed instantaneous trip settings or (2) adjustable instantaneous trip settings. The instantaneous region is represented in Figure 1, and for this example, is shown to be adjustable from 5× to 10× the breaker amp rating. When the breaker senses an overcurrent in the instantaneous region, it releases the latch which holds the contacts closed (unlatches). Unlatching permits the contact parting process to start. The unlatching time is represented by the curve labeled “average unlatching times for instantaneous tripping” (this is the continuation of the instantaneous trip curve below 0.01 second). This is important when evaluating corrdination of line side breakers to load side breakers. The manufacturer of the circuit breaker in Figure 1 also published a table of unlatching times for various currents (upper right). Unlatching frees or releases the spring loaded contacts to start the process of parting. After unlatching, the overcurrent is not cleared until the breaker contacts are mechanically separated and the arc is extinguished (represented in Figure 1 as the maximum interrupting time). Consequently, there is a range of time from unlatching to interruption as is indicated by the band between the unlatching time curve and the maximum interrupting time curve. This range of time affects the ability of circuit breakers with instantaneous trips to selectively coordinate when the overcurrent magnitude is in the instantaneous trip range. Two instantaneous trip settings for a 400A breaker are shown in Figure 1. The instantaneous trip region, drawn with the solid line, represents an IT = 5x, or five times 400A = 2000A. At this setting, the circuit breaker will trip instantaneously on currents of approximately 2000A or more. The ± 25% band represents the area in which it is uncertain whether the overload trip or the instantaneous trip will operate to clear the overcurrent. 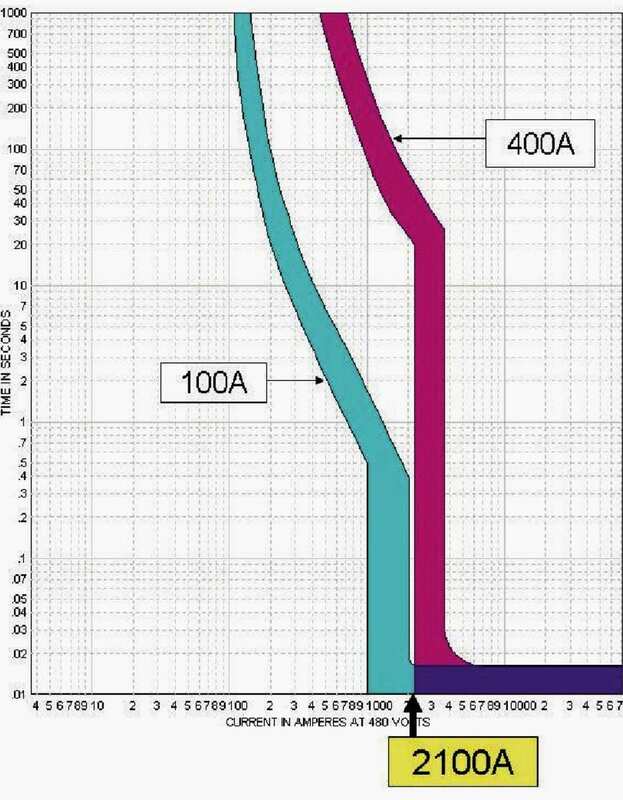 The dashed portion represents the same 400A breaker with an IT = 10x, or 10 times 400A = 4000A. At this setting the overload trip will operate up to approximately 4000 amps (±10%). Overcurrents greater than 4000A (±10%) would be sensed by the instantaneous setting. The ±25% and ±10% band mentioned in this paragraph represents a tolerance. This tolerance can vary by circuit breaker manufacturer and type. Many of the lower amp rated circuit breakers (100A and 150A frame CBs) have non-adjustable or fixed instantaneous trip settings. For larger molded case, insulated case and power breakers the instantaneous trip setting can usually be adjusted by an external dial. The IT of a circuit breaker is typically set at its lowest setting when shipped from the factory. Note that most published circuit breaker time-current curves show the vertical time axis from 0.01 second up to about 100 or 1000 seconds. The published curves do not normally provide the instantaneous unlatching characteristic. However, if a circuit breaker has an instantaneous trip, it has unlatching times usually less than 0.01 second. Some circuit breakers have short time-delay trip settings (STD). These will be discussed later in this section. The short time-delay trip option can be used in conjunction with (1) an instantaneous trip settings or (2) without instantaneous trip settings. Typically, molded case circuit breakers and insulated case circuit breakers that have short time-delay settings have an instantaneous trip override. This means at some fault current level, the instantaneous trip operates to protect the circuit breaker. Low voltage power circuit breakers can be specified with a short time-delay setting which does not inherently incorporate an instantaneous trip override. The interrupting rating is represented on the drawing by a vertical line at the right end of the curve. The interrupting rating for circuit breakers varies based on the voltage level. See the interrupting rating table in Figure 1 which lists the interrupting ratings for this specific circuit breaker. For coordination purposes, the vertical line is often drawn at the fault current level in lieu of the interrupting rating (if the interrupting rating is greater than the available short-circuit current). However, if the fault current is above the interrupting rating, a misapplication and violation of NEC® 110.9 is evident. In Figure 1, the circuit breaker interrupting rating at 480 volts is 30,000 amps. To achieve selective coordination with low voltage circuit breakers, the general rule is that no overlap of time-current curves (including the unlatching time) is permitted up to the available short-circuit current. The ability of circuit breakers to achieve coordination depends upon the type of circuit breakers selected; amp ratings, settings and options of the circuit breakers, and the available short-circuit currents. Circuit breakers with short time-delays (no instantaneous override). In the following paragraphs, various alternative circuit breaker schemes will be discussed in relation to assessing for selective coordination. Figure 2 illustrates a 90A circuit breaker and an upstream 400A circuit breaker having an instantaneous trip setting of 5× (5 times 400A = 2000A). The minimum instantaneous trip current for the 400A circuit breaker could be as low as 2000A times 0.75 = 1500A (± 25% band). 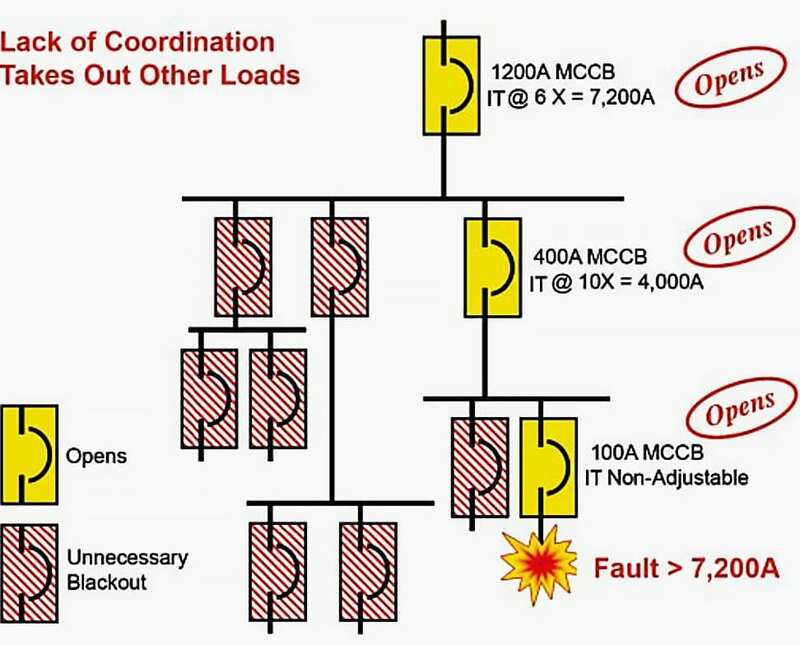 If a fault above 1500A occurs on the loadside of the 90A breaker, both breakers could open. The 90A breaker may unlatch before the 400A breaker. However, before the 90A breaker can part its contacts and clear the fault current, the 400 amp breaker could have unlatched and started the irreversible contact parting process. Assume a 4000A short-circuit exists on the loadside of the 90A circuit breaker. The 90A breaker will unlatch (Point A) and free the breaker mechanism to start the contact parting process. The 400A breaker will unlatch (Point B) and it, too, would begin the contact parting process. Once a breaker unlatches, it will open. At the unlatching point, the process is irreversible. It is similar to pulling a trigger on a gun. At Point C, the 90A breaker will have completely interrupted the fault current. At Point D, the 400A breaker also will have opened, which unnecessarily disrupts power to all other loads. These two specific circuit breakers with the settings as stated are coordinated for any overcurrent up to approximately 1500A. However, this is a non-selective system where fault currents are above 1,500A, causing a blackout to all the loads fed by the 400A breaker. As mentioned previously, this is typical for molded case circuit breakers due to the instantaneous trip and band of operation on medium to high fault conditions. In addition, this can affect other larger upstream circuit breakers depending upon the size and the instantaneous setting of the circuit breakers upstream and the magnitude of the fault current. Circuit breaker manufacturers provide Coordination Tables which show circuit breakers of specific types and ampere ratings coordinating to fault values greater than the crossing point where two circuit breaker time-current curves intersect. The norm in the industry is to display circuit breaker curves for times from 0.01 second to about 100 or 1000 seconds. So typically the circuit breaker curves are not shown with the unlatching curves as in Figure 2. The following Figure 3 illustrates a 400A (IT = 7×) circuit breaker feeding a 100A circuit breaker. However, this curve, which is the industry norm, does not show the circuit breaker characteristics below 0.01 second. For coordination analysis, the interpretation of this curve is that these two circuit breakers are coordinated for overcurrents less than approximately 2100A (arrow on Figure 3). For overcurrents greater than 2100A, these two circuit breakers, with these settings, would not be considered coordinated. Selective coordination is limited to currents below the instantaneous pickup of the lineside circuit breaker. For any fault downstream of the loadside MCCB having a current greater than the instantaneous pickup of the lineside MCCB, both circuit breakers trip, and power is interrupted to unfaulted circuits fed by the lineside circuit breaker. The other circuit breakers on the one-line diagram supply other circuits and loads. The fault current path from the power source is depicted by the red arrows/lines on the one-line diagram. For the coordination analysis, faults on both the branch circuit and feeder must be analyzed. When the curves of two circuit breakers cross over in their instantaneous trip region, then the drawing indicates that the two circuit breakers do not coordinate for fault currents greater than this cross over point. For instance, interpreting the curves for the 100A circuit breaker and the 400A circuit breaker. Their curves intersect in the instantaneous region starting at approximately 3600A. The 1200A circuit breaker curve intersects the 100A and 400A circuit breaker curves at approximately 6500A. For a branch circuit fault current less than 3600A on the loadside of the 100A circuit breaker, the 400A and 1200A circuit breakers will be coordinated with the 100A circuit breaker. If the fault current is greater than 3600A, then the 400A feeder circuit breaker may unnecessarily open and there is a lack of coordination. If the branch circuit fault is greater than 6500A, then the 1200A main circuit breaker may unnecessarily open, which is a lack of coordination between the 100A, 400A and 1200A circuit breakers. The reason is, for a fault of greater than 6500A, all three of these circuit breakers are in their instantaneous trip region. Both the 400A and 1200A circuit breakers can unlatch before the 100A circuit breaker clears the fault current. For any feeder fault less than 6500 amps on the loadside of the 400A circuit breaker, the 400A and 1200A circuit breakers will be coordinated. For feeder faults greater than 6500A, the 1200A circuit breaker is not coordinated with the 400A feeder circuit breaker. If the maximum available short-circuit current at the 100A branch circuit is less than 3600A and the maximum available short-circuit current at the 400A feeder circuit is less than 6500A, then the circuit path (100A, 400A, and 1200A) is selectively coordinated. If the maximum available short-circuit current exceeds either of these values, the circuit path is not selectively coordinated. How does this affect the electrical system? Look at the single-line diagram in Figure 6. For any fault current greater than approximately 6500A on the loadside of the 100A circuit breaker, the 1200A and 400A circuit breakers open as well as the 100A circuit breaker. The yellow shading indicates that all three circuit breakers open – branch circuit, feeder and main. In addition, all the loads fed by the other circuit breakers, denoted by the hash shading, are blacked out unnecessarily. This is due to the lack of coordination between the 100A, 400A and 1200A circuit breakers. The yellow shading indicates that all three circuit breakers open – branch circuit, feeder and main. In addition, all the loads fed by the other circuit breakers, denoted by the hash shading, are blacked out unnecessarily. This is due to the lack of coordination between the 100A, 400A and 1200A circuit breakers. As said by Jhan above explanation is really excellent, but then what is correct selection in above case? What would be correct selection of MCCB to avoid unnecessary black out of non faulty area? It can be understood, If it is explained in detail. Here what happens what is wrong is explained, but what is correct is not explained. It will be easy to understand what is correct and how should be the correct selection, if it is explained. So you say that all discrimination tables are a hoax? 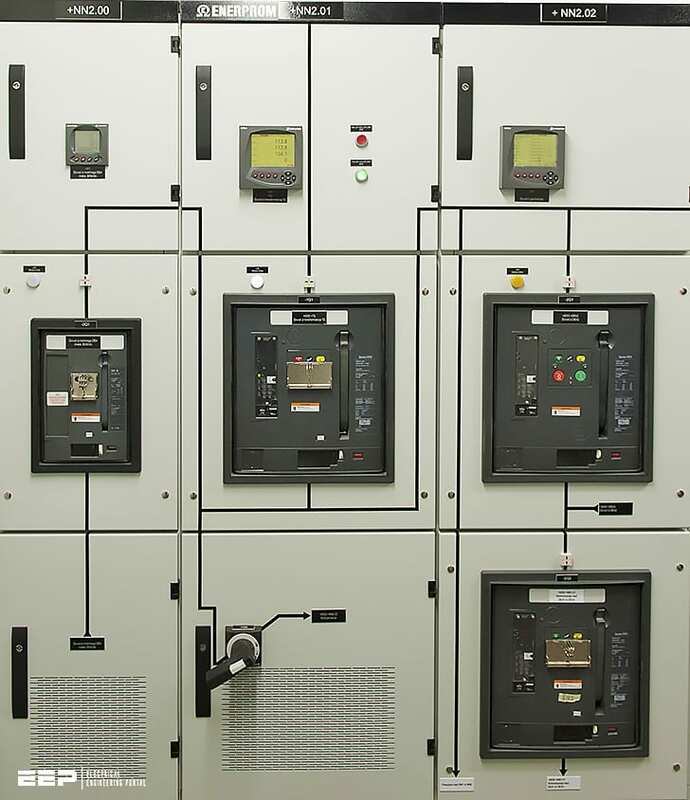 In short, ABB coordination tables show no problem with 100 A and 400 A devices. I don’t work at ABB. I have understood that the frame size of supply side MCCB affects on the current or speed of instantaneous tripping (the area that you say is not normally shown). So that it is possible to get full selectivity or up to a certain point. Provided that the tripping curves on longer times are setted correctly. E.g. ABB coordination tables show no problem with a load side T2 MCCB 160 A magnetic and supply side T5 MCCB 320 A magnetic, when the frame is 400 A. Both can be electrical up to 100 A load side. In fact, should be that a T2 160 A frame with 100 magnetic relay and T4 250 A frame with 250 magnetic or 160 A electronic relay should be discriminated. Or e.g. S290 100 A D-curve MCB with T4 250 A relay up to MCB 15kA capability, and so on. Like already mentioned, the I2t-curves should also be checked. I don’t remember them, I should use some software. To avoid unwanted tripping of between upstream and downstream MCCB/MCB for the high fault region. Please make Energy discrimination between them as either totally or partially. 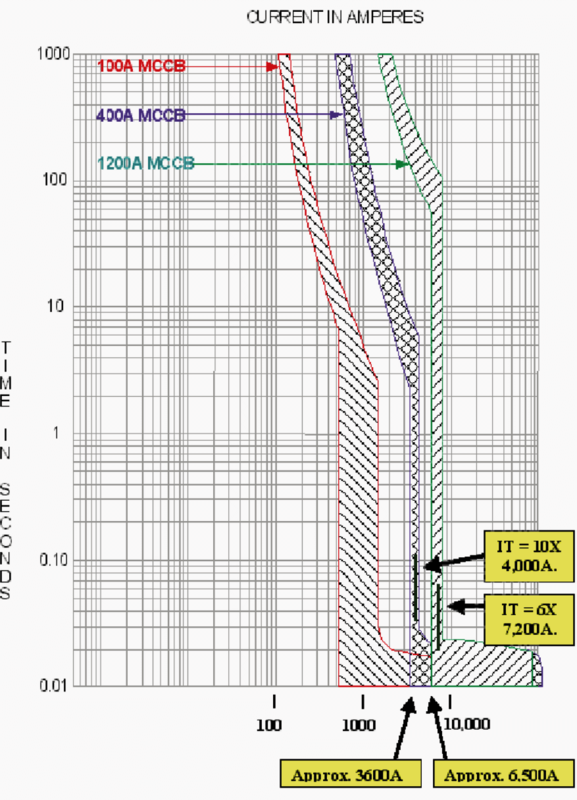 Excellent explanation, colleague Csanyi, but I would like to explain the solution with the same case, example: increasing the capacity of short circuit in 400A and 1.200A MCCB, is one and other is placing limiting fuses with 400A and 1.200A MCCB.